I should have fallen under the spell of The Vanishing Season. I love a quiet, slow, introspective novel that is primarily character-driven. Combine that with Jodi Lynn Anderson's melodic prose and the result is a miracle, the way Tiger Lily is. The Vanishing Season, however, despite containing elements that I would have usually fallen head-over-heels for, somehow managed to keep me at a distance. Its cold, unemotional stance never allowed me to fall for its story and, unfortunately, this remains one of my most disappointing reads of the year. I didn't make it too much of a secret that I loved Tiger Lily back when it came out and, similarly, I didn't make it much of a secret that I expected to love The Vanishing Season when it released. With its synopsis promising a murder mystery, ghosts, and small town setting, I really couldn't fathom how it could possibly go wrong. Well, here's how: mismarketing. Seriously, whoever wrote the synopsis for this novel needs to buy themselves a copy of The Vanishing Season, actually read it, and then do the world a favor by resigning. In reality, The Vanishing Season is the story of Maggie, our unassuming protagonist, who moves into a small town and befriends the beautiful Pauline and her childhood friend, Liam, who is utterly besotted with her. Maggie hears stories of girls in nearby towns who are mysteriously murdered but, make no mistake, this is not a murder mystery novel. Anderson, in no capacity, focuses on this background plot line throughout the course of her narrative and The Vanishing Season very firmly remains an intriguing character study. Admittedly, there is a ghost, but more on that later. Now, I am all for character studies. Courtney Summers's novels are all, in my opinion, intense character studies of her multiple protagonists, just as Tiger Lily managed to be an in-depth analysis of Peter and Tiger Lily's doomed romance. The Vanishing Season looks closely at the dynamics of these three friends--Maggie who is falling for Liam who is hopelessly in love with Pauline who cares for no one. It is a love triangle, but admittedly an interesting one. I didn't quite mind exploring the changing dynamics between these three, at least not at first, but as the novel wore on and certain circumstances came to pass, I grew irritated, mainly because nothing much happens in this book with the exception of this strange love conundrum. The Vanishing Season is a slow, slooooow novel and I'm not sure I ever even fully got into it in the first place. Every chapter finishes off with a first-person account from the ghost who resides in the home Maggie has just moved in but, nevertheless, this is not a ghost story either. Much like how Tiger Lily was narrated from Tinker Bell's perspective, parts of this novel are narrated from the ghost's perspective and she looks in on these lives. I practically skimmed these sections in the beginning, though they later became the most interesting part of the narrative. Ultimately, however, I find it difficult to summon up much feeling for any part of this story--forgive me, readers, for this apathetic review. What I do feel quite strongly about, however, is the ending of this novel. For those of you who don't already know, I love ambiguous, unlikable, and tragic endings. Sure, a happily-ever-after gets me smiling every time but a tragedy gets me thinking long after. Where Tiger Lily concluded on a bittersweet, brooding note, however, The Vanishing Season ends in such a way that the reader is left distraught. Anderson's novel lacks true meaning. We've stuck with these characters for so long through such a meandering, tiresome plot only to have the ending reflect the cruel twist of fate when karma doesn't work out and bad things happen to good people. Thus, it isn't an ending I felt added to the meaning of the novel, of my life, or of the world as a whole. Every book, in my eyes, should have a purpose; a goal or reason for being written. Maybe it's just written to entertain--which, trust me, this book was not written to do as its so dull--or it's written to express a theme or a belief, but the conclusion of this novel only further detracts from this story because of its inability to convey a strong, wholesome message. Perhaps there are gems of wisdom weaved into this conclusion, but I definitely missed them. The Vanishing Season failed to inspire feeling and, for a character-driven tale, that only spells demise. Its plot disengaged, its characters failed to compel, and its conclusion left me devoid of much hope for our universe. Thus, I really can't say I recommend this one at all. In fact, I'm going to pick up my well-worn hardcover of Tiger Lily from my shelves--I seem to have forgotten why I loved Jodi Lynn Anderson so much in the first place. Oh I'm sorry that this book didn't work out for you Keertana. But I don't think you're the only one who was disappointed with this book A lot of readers who loved Tiger Lily felt that this book fell flat with them. I didn't end up liking Tiger Lily as much as everyone else did, but I may consider giving this book a go for Anderson's gorgeous writing alone! Beautiful review as always! Such a gorgeous cover...but a disappointing inside, it seems. I agree--character studies have their place and it's great when we really get to the nitty-gritty of a character(s) but not at the expense of pacing and, well, a story. I think I'll take a pass on this one. I'm so sorry this book didn't work for you. 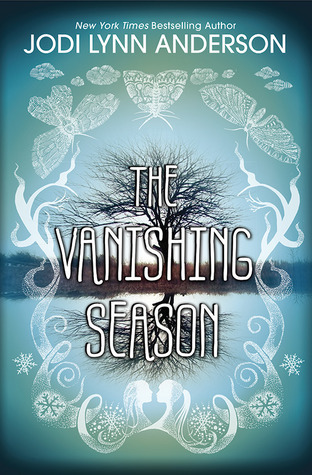 I have been seeing more negative reviews for The Vanishing Season than for any other novel. I haven't read any book by this author.I need to read Tiger Lily soon. Great review, Keertana!! Ouch! So sorry you were burned by this book, Keertana. I don't care much for a book without purpose either. To find out this story is not only a bore, but there's no real message to lift it up, is a huge disappointment. I'll just try Anderson's Tiger Lily and stop there. Thanks for warning the rest of us with your beautiful and brilliant review! Oh no! I totally wanted to read this one because of the synopsis but now I am not so sure. Maybe because of your warning I will actually be able to enjoy this one more but still, so disappointing to go into this expecting one thing and getting something entirely different. I was SO looking forward to this one too, Keertana. I loved the prose, but I think just about everything else (including plotting, characterization, etc) could have been improved. A shame, because it was such an interesting premise. Oh bummer! I put this book and the audiobook on my wishlist at my library (I wonder if the audiobook format would read better than the print version?) - but I'm either in no hurry to get to it or am really less-than-interested to get to it. I hate that it failed to meet your expectations - that is always so disappointing, especially after you fall so hard for a previous book. Better luck with the next one! Or better yet, better luck with the re-read! Oh, that's so disappointing, Keertana :( I've been really looking forward to this one, and while I, too, love endings that don't always wrap up neatly, if it's purposelessly destructive, I don't think I could deal with that. Thanks for your honest review. Oh! That's such a bummer. This seemed to have such promise and the cover is beautiful. Oh well, thanks for the heads up on the let down! Damn. I had high hopes for this one Keertana as I've heard so many great things about Tiger Lily. Like you, I really enjoy character studies and slower stories that really make me focus, but this one sounds like it's just a touch too slow. So slow as to make it difficult to really settle in. Thanks for your thoughts! I am wary of Tiger Lily because of the ending, but do want to read it because I've heard the writing is good. However, when presented with this kind of ending... I don't think this one is for me. I don't mind slow with payoff, but this doesn't sound like the payoff is worth it. Still, great review! aww dang, I was kind of really curious about this book as well. sorry it didn't work for you and the ending sounded disappointing? Your description of your reaction to The Vanishing Season in the first paragraph here is actually exactly how I felt about Tiger Lily. I know I'm one of the few people who disliked that one, but c'est la vie. I was hoping for a stronger connection to this one, but now I wonder if that will be the case. Nevertheless, I am sorry to hear that this reading experience was so disappointing and frustrating for you. All authors have off works - and I hope the Anderson's next work is one that makes you revert back to loving her stories again! This book lacked something special that Tigerlily had. I didn't quite care about the characters, but there's something so beautiful about Anderson's writing! Great review! YIKES! This book is NOT for me. At. All. I love beautiful writing, but I would HATE this triangle, and with nothing else going on and a devastating end without true meaning?! I will stay far away from this one. I'm glad you read it so you could warn me at least! "Every book, in my eyes, should have a purpose; a goal or reason for being written. Maybe it's just written to entertain--which, trust me, this book was not written to do as its so dull--or it's written to express a theme or a belief." This is how I look at new books, exactly, and I try to look at a book from the point of view of what I think it's trying to do. When the answer is "nothing," I get really frustrated. It's cool to see someone else with the same philosophy!